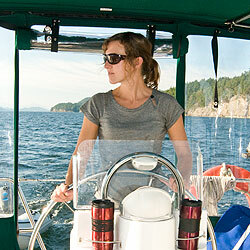 A hassle-free getaway for two through the heart of the gulf islands. When one thinks of the LOVEBOAT, the image of a luxury cruise liner with lovers promenading about the decks comes to mind. For my husband and I, it was the idea of chartering a sailboat to explore the Gulf Islands on a four-day getaway just for two; a chance to relax and re-connect to ourselves, each other and to the sea. After dropping off our young children at Nana’s and heading south to Nanaimo, Greg and I are giddy like two teenagers alone for the first time. Our station wagon is packed with crab traps, gear and provisions as we drive to Stones Marina in Nanaimo on Vancouver Island. 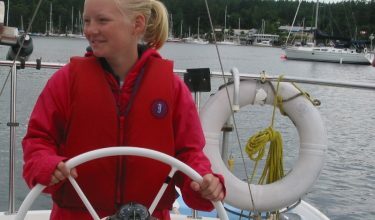 We’re chartering with Nanaimo Yacht Charters and Sailing School, located in a convenient and central location to the Gulf Islands, and a direct flight or ferry from Vancouver. Within minutes of pulling into the main dock’s unloading zone, we are met by friendly staff member Trevor Matthew, a certified CYA and ISPA instructor, who promptly leads us down the marina to our gorgeous Beneteau 331, Kala Kala. Unzipping the fully enclosed cockpit cover, past the binnacle instrument pod and steering wheel, we descend below for the start of our orientation. Kala Kala is a model yacht of luxurious coastal cruising having ample headroom, large head, shower and two main cabins, her teak interior polished and shining. A reusable gift bag welcomes us from Nanaimo Yacht Charters, and our berth’s crisp navy sheets and towel set belies a grand hotel. Trevor runs over the yacht systems, which are reinforced in the onboard manual, and takes the time to familiarize us with the boat before handing over the keys. Next we stop by the office, where Elenor, daughter of owners Ian & Shari MacPherson (also co-owned by Lorraine Bell), greets us with complimentary sunhats and goes over the necessary paperwork. We sign the Bareboat Charter Agreement, leave a refundable damage deposit and head to the classroom. Trevor, an expert at trip planning, pulls out the charts and we go over our route. With our loaned case of charts, guidebooks and current table, Trevor gets a wagon, we load our gear and I move our car to their designated parking area.